If you haven’t been able to control your pain and other symptoms despite the trying various movement exercises, massages, and pain relieving medications are not working for you then your chiropractic may recommend electrotherapy—a treatment that applies mild electrical pulses to the problem area. Electrotherapy is a stimulation therapy that uses electrical energy as a medical treatment. As daunting as it may sound initially, it is a very calming, the electric pulses are very mild and it is a proven method medical treatment used to relieve muscle pain, reduce the recovery time, and speed the healing process. The term “electrotherapy” has also been applied specifically to the use of electric current to speed wound healing. It is primarily used in physical therapy for relaxation of muscle spasms, increase of local blood circulation, muscle rehabilitation and re-education electrical muscle stimulation, maintaining and increasing range of motion, management of chronic pain, post-traumatic acute pain, post surgical acute pain, and wound healing..
How it works is the electrotherapy units consist of a battery-powered device that is connected by wires to electrode pads that are adhesive. The electrode pads are placed onto the skin, in the affected or injured area, since they are adhesive, they adhere to the skin pretty well. Once the electrode pads are secured on, the unit is powered on and a mild electric current is transferred to the skin via the electrode. For most people, electrotherapy feels like a vibrating massager or a buzzing, tingling sensation. It is not painful and it certainly won’t cause as much pain as the issue that brought you to electrotherapy to begin with. 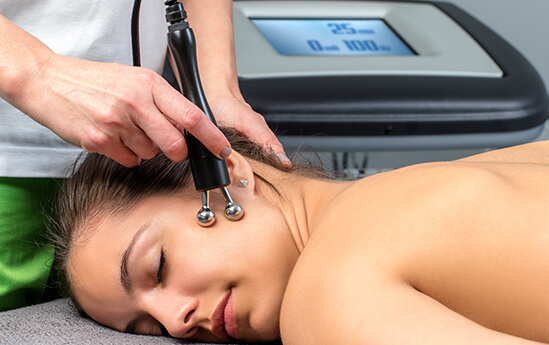 The electrode is quite literally vibrating the muscle under the skin and some people find the experience quite relaxing. To dive into how it works in more detail, you would first need to understand how the feeling of pain is transmitted in your body. When you feel pain it’s normally due to a injured nerve. An electrical signal is sent from injured nerve to the brain. Electrotherapy also known as electrical stimulation to treat nerve pain works by sending its own electrical impulses to the brain. The change in signals seem to interrupt or block the pain signals from the injured nerve to the brain, reducing the amount of pain you feel. It is a non-invasive and drug-free viable therapy option that is worth exploring. Often medications can create dependency issues, it doesn’t always solve the issues, it only masks the pain, and can leave you feeling fatigue. The first step you can take to recovery is alleviating pain so that you can focus more on movement and exercise. Depending on your symptoms, your chiropractor may recommend that electrotherapy is the best option for you.